Alton Towers may be renowned for white knuckle roller coasters with intimidating names but it’s lesser known for its pre-theme park days as an expansive country estate. 10 minutes from Nemisis, Oblivion and The Smiler, tranquil Greenacres Farm is a product of that time, with a farmhouse built in the mid-19th century and surrounding Churnet Valley countryside that’s been farmed for generations. From the moment you arrive, rumbling over a cattle grid and down a short driveway flanked by cows, it feels like the antithesis of a theme park. Breathe it in. Space, country views and lungfuls of fresh air. Home to Tessa and David, Greenacres is set in 11 cattle-grazed acres that have been farmed by Tessa’s family since 1864. Today the old cowshed and pigsty have been transformed into a snug holiday cottage – think low exposed beams and cosy nook bedrooms – while, outside, a newly built shepherd’s hut resides, sat on its own private terrace and framed by small potted trees. 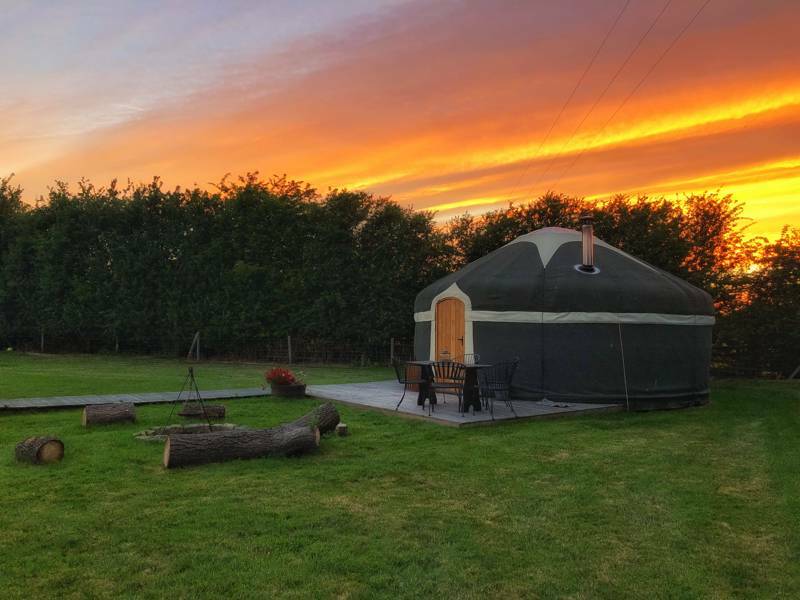 The hut itself is a beautiful and comfortable affair, with a full-sized double bed, an en-suite shower room and a fantastic kitchen space with a fridge, hobs, sink and everything you need. A wood-burning stove adds to the suitably snug feel, while french window doors let natural light pour in. It’s the detailed finish and personal touches, however, that really make the shepherd’s hut stand out: The copper lampshade, the bunting beside the bed, a stash of hardback books, country-themed artwork on the walls and the tasty Staffordshire hamper on arrival. It’s all symptomatic of Tessa and David’s friendly and hospitable nature. Outside, fruit trees – plum, appe, damson and quince – pepper the garden and an old Victorian swing hangs invitingly from an ash tree. A wooded stream runs just below, feeding into the River Churnet, and, if followed, it’s only a few hundred metres to the old Churnet Valley railway line, now a popular footpath and cycleway. Follow it north and it’s about half an hour before the shrieks and laughter tell you you’re alongside Alton Towers Theme Park or stroll south where, 10 minutes away, the old Denstone Village railway station brings you out beside the local pub and the village’s farm shop. Elsewhere, the market town of Ashbourne is just under 15 minutes by car and Leek is half an hour away, each acting as a gateway town into the Peak District beyond. Welcome to Greenacres! We're Tessa and David, and we live in our family's farmhouse set in the middle of 11 acres of organic pasture on the edge of the small country village of Denstone, Staffordshire. The land has been farmed for centuries, and Tessa's family has been here since the middle of the 19th century. We are 10 minutes from Alton Towers, close to Ashbourne and the Peak District, and a short walk from the centre of the village. It's ideal for walkers, cyclists, nature-lovers, or if you're just looking for a lovely place to relax. For latest availability and best prices for The Parlour at Greenacres , please use the Date Search above. 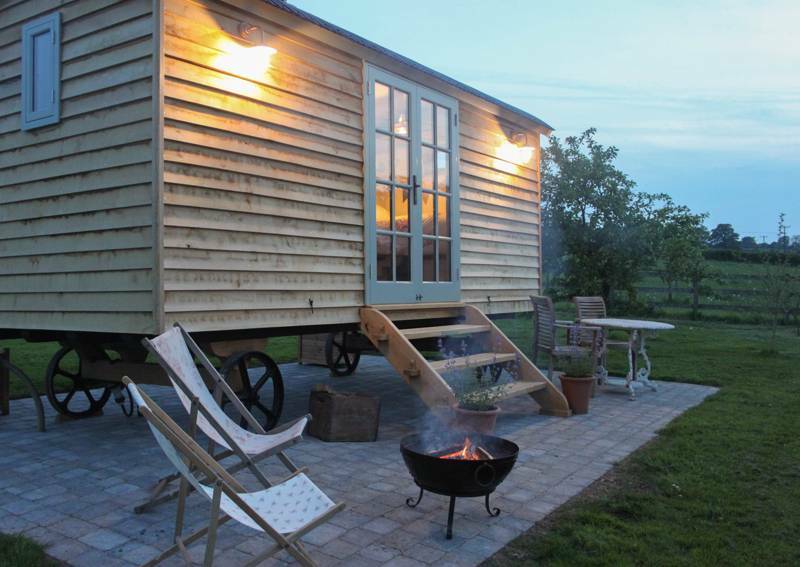 A single, luxury, self-contained shepherd's hut sleeping 2 people. The Parlour sleeps 2 in a full size double bed and features a fitted kitchen, en-suite shower (towels provided) and toilet, a dining area and a wood-burner. The kitchen has induction hobs, a fridge, sink, kettle, toaster, all the expected utensils, cutlery, crockery and tea and coffee making items. Outdoor patio area with kadai barbecue and seating. There's a radio, two USB charging points for your mobiles, and a hair drier but there's no TV or WiFi. There's free off-road parking as well as all the logs you need for your log burning stove and kadai. Surrounding the Parlour is an orchard of fruit trees, and your front doors open to a spectacular view of open fields, trees and The Weaver Hills in the distance. There's an antique swing you can enjoy it all from, hanging in the branch of an old ash tree close by. There are ample local walks directly from Greenacres, including rambles alongside the River Churnet and into Denstone and to the farm shop or pub. For many, it's the appeal of the Peak District National Park, to the north, that is strongest. It's 7 miles (a 15-minute drive) to the park boundary, though, for a little culture, stopping short in the Georgian town of Ashbourne one day is recommended. If the history takes your fancy, National Trust-owned Calke Abbey (01332 863 822) is a 45-minute drive east – a Baroque mansion built between 1701 and 1704, the National Trust has deliberately left it in the condition they found it, telling the bitter-sweet story of the end of a family line, complete with peeling paintwork and overgrown gardens. 50 minutes north, meanwhile, grand Chatsworth House (024 6565 300) was completed in the same year but is quite the opposite – impeccably well kept (and features in a number of renowned, period films). Closer to home, the volunteer-run Churnet Valley Railway runs steam trains throughout the year and has a good cycling route alongside much of it, while the Staffordshire Way is a top pick for walkers (as well as, of course, the Peak District and The Roaches to the north). Finally, it goes without saying that Alton Towers theme park is 3 miles away, so if you really want some high-octane fun, there are rollercoasters aplenty on your doorstep. It's easy to buy local around here. There's the award-winning Denstone Hall Farm Shop in Denstone (01889 590050), ½-mile from your shepherd's hut, while Nigel the Butcher (01335 342073) in Ashbourne (7 miles) comes highly recommended by Tessa (as does the Bakehouse on the market square for "the best bread you've ever had"; 01335 347206). Sam's Hens (07967 437896), reared just down the lane, produce delicious free range eggs, which are sold in the Spar in Rocester (2 miles). For pre-made pies, bacon, meat and other good things, Staffordshire Traditional Meats (01889 568411; 4 miles) looks unassuming (just barns from the outside) but is an absolute must. If you don't fancy cooking yourself, say hello to Chris, the friendly landlord in The Tavern (01889 590847), the local pub half a mile down the road or try The Bull's Head (01538 702307) in Alton where there is often a live band. Further afield, the Black Lion (01782 550294) in Consall Forge serves real ales and is well-placed for a good canalside walk and views of the steam trains on the Churnet Valley railway line. Mid-weeks £85 per night (for 2 people), weekends £95. 2-night minimum. Greenacres Barn is 15 minutes from Uttoxeter by car, off the A50 trunk road. Just follow the signs for Alton Towers, then, when you are on the B5032, look out for the signs and the turning as you come out of Denstone (on the right). Uttoxeter is the nearest railway station and has a taxi rank outside (it's a 15 minute journey from there to Greenacres Barn).